This entry was posted in Birds (鳥), Photography (写真) and tagged aquatic birds, イソシギ, birds, common sandpiper, 野鳥, sandpipers, shorebirds, 水鳥, 水辺の鳥 by T Ibara Photo. Bookmark the permalink. You’re doing some great bird photography Takami! I’m glad you’ve enjoyed these images Maria! Oh this Sandpiper takes the photo session seriously 🙂 He is probably waiting for the tide to go out. Beautiful photograph, Takami! Very beautiful. I just wonder what the bird is thinking. 🙂 Thank You sharing this photo with us. 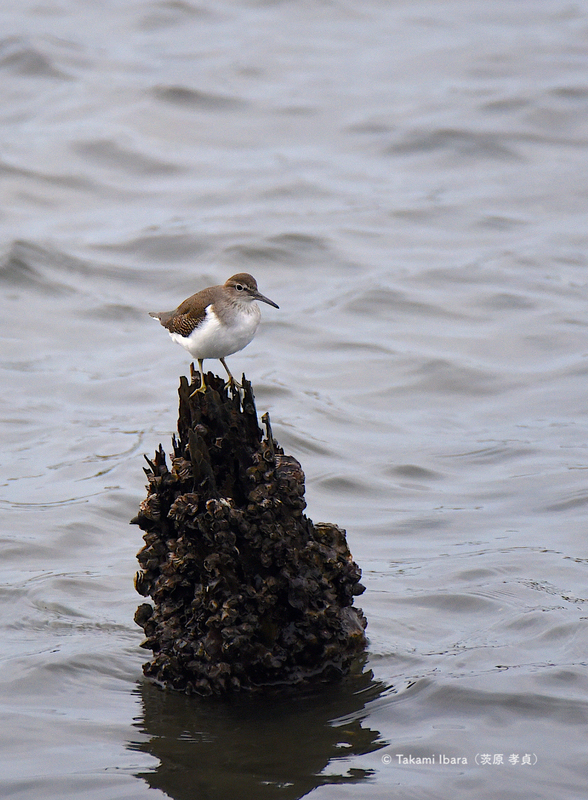 This is a Common Sandpiper, a very small (around 20cm) wader/shorebird and one of the few that live in Japan all-year long. The winds were strong on this day, and I was amazed how he kept his balance and focus as he searched for food! What a perfect moment you have captured! It does take patience and more patience (plus a humble heart/open mind) to find the right moment. But, I've also learned that if I "let go" of my own personal ego, then Nature really is right there, waiting to be observed. Excellent photo! What a beautiful bird. Yes indeed! He does not look very common to me and you’re right all God’s creatures are special! Peace and blessings to ya. Haha, he does look quite triumphant on top of his stump. Wow, he is balancing so well on those tips of wood! Great capture, Takami! A delightful little guy, Takami! Hugs on the wing. Wonderful shot! Would you happen to know what its name is?